See How Easily You Can Get Motivated Seller Leads Using a Soda Can? 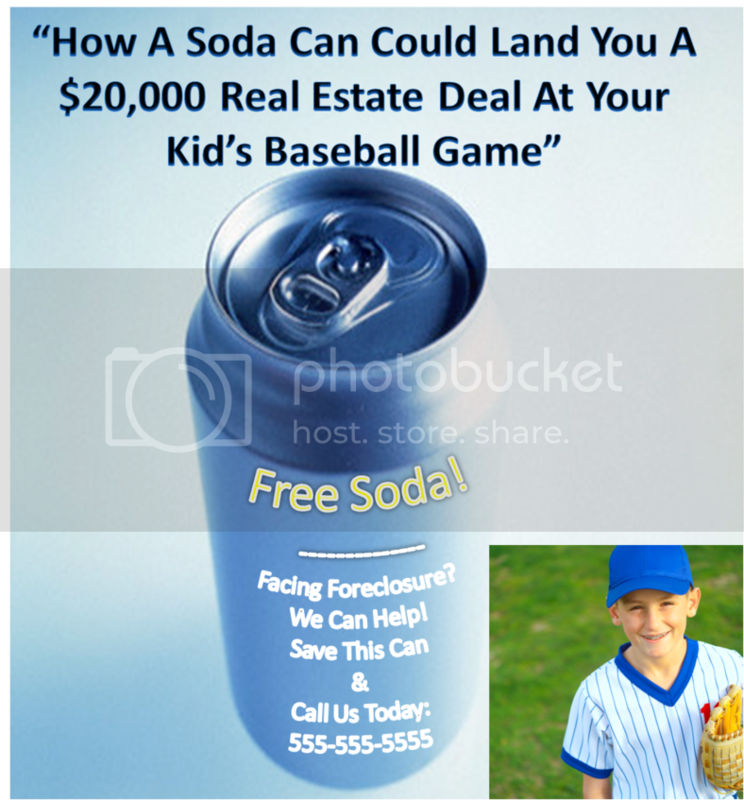 Home›Real Estate Marketing›See How Easily You Can Get Motivated Seller Leads Using a Soda Can? 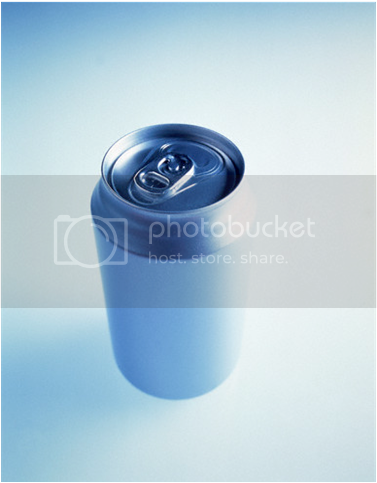 How could something as simple as a soda can help you get motivated seller leads? When I first heard about this marketing strategy I was immediately intrigued by how “outside the box” this strategy was. Just imagine you being known throughout your local community as the guy or gal who takes down real estate deals armed with nothing but…a Soda Can! Before you say this will never work… Let me say that someone has already tried this strategy I’m about to reveal to you. I’ll be straight up with you though…I’m not sure if they were able to generate a profit. Entrepreneurs and Marketers are always testing new ideas. Also, there is a BIG Company using this strategy as well…I’ll show you that in a minute. Overall, I think it’s Smart Marketing and I’ll tell you why this strategy works so well. Simply wrap the flyer around the can with rubber bands or tape to keep it in place. 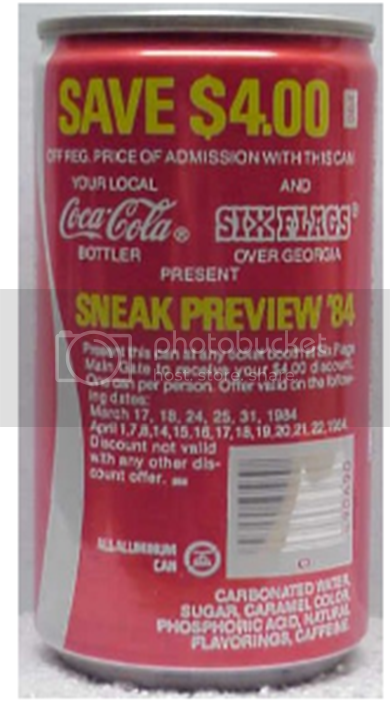 You could also have an ad printed on the can, however I’m sure that would cost much more and you’d probably have to form some type of partnership with the company that produces the can. I haven’t looked at how to go about doing that, nor do I recommend that unless you are making a boatload of money using this strategy and can see a good ROI. The flyer would of course talk about your business and how you can help someone get their home sold fast! I think this stategy works so well for one reasons. 1. You are providing value right out of the gate. Not only are you giving someone a free soda, you’re giving them a potential way out of their problem by buying or trying to help them sell their home. If they are a really motivated seller, they could probably care less about the actual soda and immediately start reading your flyer , then tuck it in the pocket afterwards for safekeeping. Now I know what you might be thinking… Lamar, What if they don’t need to sell their home? Now you don’t have to offer a referral fee if you don’t want to, but again I’m always thinking… “Value First” How can I provide them value? How can I get them motivated? Anyway, if you actually do close a deal, then I think you get to have bragging rights! Oh and the Big Company That Uses This Strategy… Six Flags! This is actually an old can, I’ll try to find the one they actually use to this day. The one they use right now says, “Buy One Ticket, Get One Free! It’s an insane deal and people are definitely capitalizing on it. I just used it 2 weeks ago when I went to Six Flags with the family. Anyway, that’s it for this strategy. Let me know what you think…Is it a waste of time? Is it something you would try?… and also tell me in the comment section what low cost marketing strategies that you use to market your business or what strategies can you think of that we should test. wow.now that is thinking outside the box. I love it!!! When I started to read your post I thought “god this guy is crazy” after I read the hold thing I thought I said to myself shoot This is one of the most creative ideas I have heard in a long time. As with everything, of course, try it out and measure your ROI. Inexpensive marketing tactics can have amazing returns(or really crappy ones) just like really expensive marketing tactics can have great ROIs (or really crappy ones). @ Meghan: Thanks I like the referral portion too. It can be really viral, especially when a reputation is established. I think this is great strategy to find motivated sellers because you are thinking “outside of the box”. The most important thing to remember is to measure your return of investment to make sure you are not flushing money down the toilet. I am glad that you mentioned that in your post. It doesn’t matter what kind of marketing strategy you use to find motivated sellers as long as when you find them you close deals.